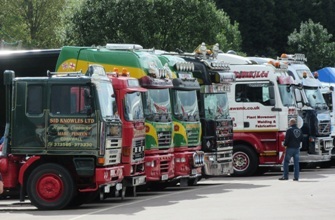 Up to 400 trucks gather for truck nostalgia! Up to 400 modern and classic trucks will gather for two days of truck nostalgia at the British Motor Museum on Saturday 8 & Sunday 9 September. In its eighth year, the Retro Truck Show is one of the Museum's most popular shows and features some of the finest trucks manufactured between 1970 and 2000, including Volvo, Scania, DAF, Foden and ERF trucks. This unique show is a great day out for truck owners, drivers, and enthusiasts as well as members of the public. The show, which has a fantastic family friendly reputation, also has a laid back and relaxed atmosphere setting it aside from other truck shows. Tom Caren, Show Manager at the British Motor Museum said "The Retro Truck show is an extremely popular show and seeing so many magnificent trucks from different decades is a great spectacle to see. Some of these trucks are over 40 years old but in such fantastic condition. Even if you don't own a truck you should come along and enjoy the nostalgia!" Any truck that falls into the age category of 1970 to 2000 is welcome whether they are show trucks, working trucks or work in progress! There are no trophies or judging, just the opportunity for like-minded truck lovers to get together and admire the displays. To enter a truck just visit the website, advance vehicle entry costs £15 per vehicle and includes entry for both the driver and one passenger, with additional passengers passes available to purchase. Camping is also available on the Friday and Saturday nights and there will be live entertainment, a charity raffle and a licensed bar on the Saturday evening. To accompany the impressive truck displays outside there will be an indoor Model Show as well as indoor and outdoor trade areas. All visitors and exhibitors can also enjoy exploring the Museum, Collections Centre and the Car S.O.S exhibition, as entry is included within the Show ticket. Show tickets on the day cost £17 for adults, £9 for children and £45 for a family, but discounted tickets can be purchased online in advance. Gift Aid Annual Passes, Tesco Club cards or any other promotional offers are not valid on Sunday 9 September. To find out more about the British Motor Museum & the Retro Truck Festival please visit http://www.britishmotormuseum.co.uk/events/retro-truck-show or call 01926 641188.